There is a huge difference between work brain and blog brain. Work brain says: What time is that meeting? How much time until lunch? Numbers, e-mails, ohmygoshmyphoneisringingagain?! 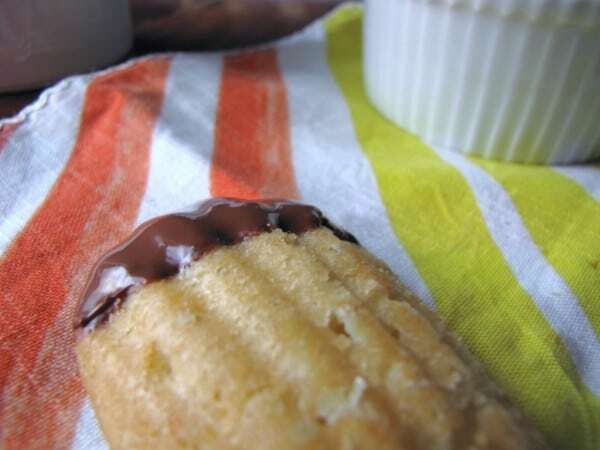 Blog brain: Ohh look at those pictures…I should make those Vegan Madeleines again, but double. Then dip it in chocolate. Then cover it in sprinkles! Yes! Maybe I’ll eat a few (er, six) first just to make sure they are good. Yep, still good. I’ll just live off these forever, thanks. The time transitioning between work brain and blog brain is usually done when I come home, have a snack, and plan out my plan of attack for the night. The problem is, these were my snack the other day, and I ate way too many to even count. I do love a sweet treat, but honestly, unless I absolutely LOVE it, I won’t go back multiple times to sneak another portion of a treat. Usually, this is due to the fact that, by the time I am completely done baking something, I’ve eaten the batter, the coating, and looked at the pictures for quite some time. By the time it’s over, I’ve usually had my fill of whatever I made. Except for these! I know I have claimed my tendency to not make things that require single use pans or tools, but really, these Vegan Madeleines are really worth it. I bought the pan on a whim to make a treat for a Downton Abbey themed blogger meet up, and haven’t looked back since. The ladies at the party couldn’t believe they were vegan, mission accomplished! But, the journey to Madeleine Land has not been a smooth one. I tried 3 recipes to find the perfect amount of crunch, soft interior, and crumb, resulting in a slightly crisp outside, with a soft, citrus scented interior. Lovely! One of the keys to making the perfect ridges is to grease and flour the pan properly. A medium amount of cooking spray distributed evenly, along with a dusting of flour, creates the perfect amount of lubricant for the cookies to slip out of the pan, without getting weighed down by the extra oil.. The end result should look like a slight dusting of snow has fallen, slipping right into the ridges of your French patisserie pan. Take care to make sure the edges area very slightly browned, so the cookies pop right out of the molds if they need a little encouragement. The chocolate coated is optional, but highly recommended! 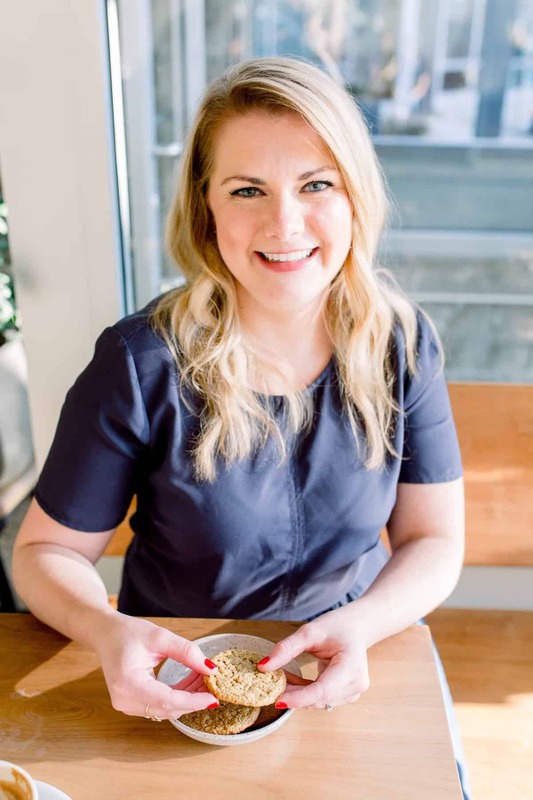 (“Oh I wish I hadn’t dipped this in chocolate” said no one ever) Saying yes to chocolate is something both the work brain and blog brain can always agree on. 1. Position a rack in the middle of the oven, and preheat to 375 degrees, Grease madeleine pan, ensuring to coat the ridges. Dust the molds with flour, tilting the pan to coat the surfaces evenly. Turn pan upside down, tap to discard additional flour. 2. In the bowl of a stand mixer, combine the eggs, granulated sugar, and salt. Beat on medium high speed until pale, thick, and fluffy, about 5 minutes. Beat in the vanilla and almond extracts. Sprinkle the flour over the egg mixture and mix on low speed to incorporate. 3. Using a rubber spatula, gently fold in the orange zest and half of the melted butter until just blended. Fold in the remaining butter. 4. Divide the batter among the 12 prepared molds, using a heaping tablespoon of batter per mold. Bake the cookies until the top springs bak when lightly touched, 10-12 minutes. 5. 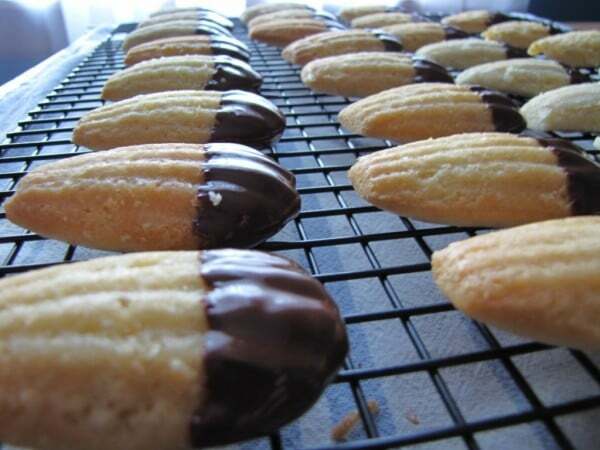 Remove the pan from the oven and invert it over a wire rack, then rap it on the rack to release the madeleines. Let the pan cool for 5 minutes, then gently release any edges that are sticking. 6. To coat the ends in chocolate: Melt 1 tablespoon coconut oil (or butter) with 1/2 cup chocolate chips in microwave for 30-45 seconds, or until melted. Dip ends of madeleines in the melted chocolate and let set in refrigerator until solid. Store at room temperature for 3 days. “Oh I wish I hadn’t dipped this in chocolate” said no one ever. Haha! Oh I love you Abs! Have trouble finding Ener-G eggs where I live – do you think flaxseed or applesauce would work? Or should I just splurge and order Ener-G online? And if so, do you go ahead and prepare the powder with water? By the way, isn’t it just amazing when a tricky veganizing recipe comes together! Hi Megan! I think applesauce would work better than a flax egg, but I’m not sure how it would affect the rising and texture of the cookies. I would say splurge for the Ener-G, I bought a box quite some time ago and it has lasted me a long while! I agree, it is SO amazing when they come together, especially when I have no expectation for them to! Let me know if you try any egg replacements, I would love to know if they work. Yeaaaa! 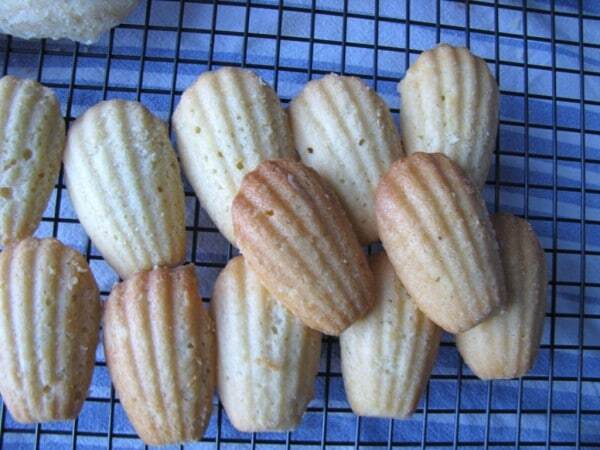 I love madeleines! And now I can share them with my vegan friends. Thank you! You are so welcome! Let me know if you make them! I just want to know… We don’t have things such as Ener-G eggs or Earth Balance – I don’t even know what they are! Could you please tell me more about them, about substitutes (I’m vegetarian, not – yet – vegan)? Thanks! I’ll be visiting here more often! Earth Balance is a non-dairy spread, comes in tub or stick form and is the closest thing to non-vegan butter. It’s awesome and perfect for baking if you can get your hands on some. Otherwise, you can go ahead and substitute regular butter, the same amount in any of the recipes. Ener-G is a powdered egg substitute, which is mixed with water to create the rising and binding of eggs. Again, you can use eggs in place of the Ener-G ( 1 Ener-G= 1 large egg). You can usually order Ener-G online, but like I said, regular eggs are a find stand in. It was interesting to hear everything it took to get this right. It takes me 3 times to get a recipe right a lot (and I’m not even trying to do it vegan)! Hi Inger! I usually can modify recipes with no problem, but some are more fickle than others, like this one! Eggs are probably the biggest challenge in modifying vegan recipes. I haven’t eaten madeleines in ages and these look so tempting. I love the flavour combination, surely they taste fantastic. Can’t wait to try them. Thank you for sharing the recipe. You are welcome! They are so so good, I hope you like them! I’ve been dreaming of making madeleines since a long time. But just haven’t made them because I don’t own a pan. As soon as I get a pan, I’ll try your recipe. These look really delicious! I held out on getting a pan for the longest time, but it was SO worth it! The Ener-G egg replacer does a good job of causing them to rise, ensuring that they have a good amount of lightness to them. I hope you enjoy! Thank you for your recipe! It seems you forgot to mention the orange juice – when do you add it? I added it along with the extracts and the cookies turned out delicious and pretty. Ack you are right! Thanks for catching that, I need to go back in to add it! I’m glad you loved them!